Choose from ten miniature eateries by Triangle chefs, all with unique menus made from locally sourced, seasonal ingredients. Seasonal North Carolina seafood, fresh daily from the coast. Everything from oyster plates and simple ceviche to market fish you can take home and prepare yourself. A seasonal, Southern eatery highlighting the cultural roots and bounty of produce our region produces, from scalloped potatoes and hot cakes, to tomato salad, chicken potpie and eggnog-pecan French toast. Creative tea and coffee beverages inspired by both the growers and producers who provide the ingredients, and the people who enjoy drinking them. House-smoked meats, sausages and charcuterie for deli sandwiches or sliced. They will also have a selection of local cheeses – to enjoy at the Hall or to make your own charcuterie and cheese board at home. Neapolitan style wood fired pizza with naturally risen dough, and sweet gelatos and sorbets made from scratch. Cookie cakes and dessert flights, giving you delicious small tastes of multiple desserts – you can try them all! Heirloom corn and nixtamalization to produce items like tacos, tamales, and tostadas that celebrate both Mexican and regional agriculture. Gourmet bagels made in house to create avant-garde bagel sandwiches and bagel-burgers. Authentic Peruvian cuisine created with love. Organic juices, smoothies, salads, and more with inventive ingredients (and named after our dogs) to help you feel your best. Please apply if you are interested in joining our Waiting List. 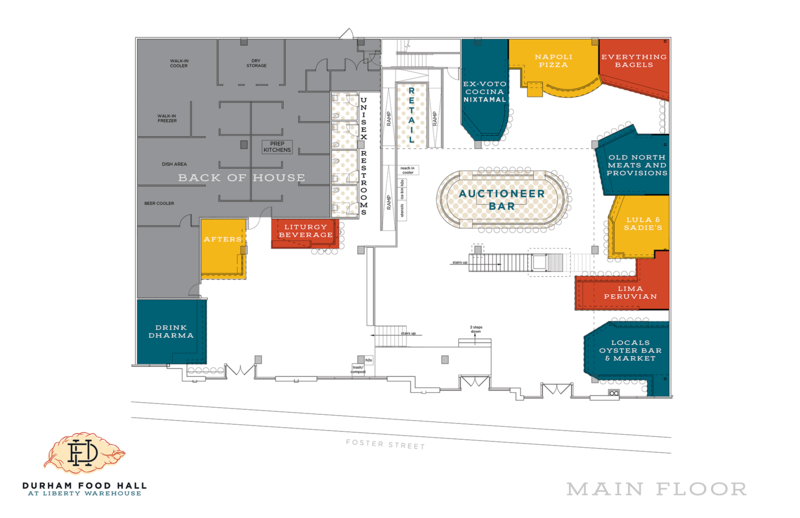 Why would you like to become a vendor in the Durham Food Hall? What type of cuisine would you like to serve at Durham Food Hall? Please describe some of the sustainable practices you would incorporate in your business at Durham Food Hall?